As articles and blog posts often point out, US naval forces have been largely unchallenged at sea since World War II. Today we face the largest danger since 1945, in the form of severe budgetary cutbacks and fiscal austerity that affect our manning and readiness. After nonnegotiable items like paychecks and food supplies, there is little leftover for R&D, systems upgrades, or the planned expansion to 300 vessels in the next decade. We face a paradox: while the Navy’s budget is downsizing, its mission requirements are expanding. With the rebalance to the Pacific, there is a lot of ocean that the Navy has to cover—64 million square miles in fact. Our forces are occupied daily from maintaining ballistic missile defense off the coast of North Korea to aiding efforts in Japan after the nuclear disaster at Fukushima to monitoring territorial disputes in the East China Sea to conducting counter-piracy operations among the Indonesian archipelagos. In the words of Admiral Greenert, Chief of Naval Operations, “Presence is our mandate. We have to be where it matters. We need to be there when it matters. And we need to be ready when it matters.” How can we be there, from the Strait of Malacca to the Second Thomas Shoal, when we’re $14 billion dollars short? It requires the reversal of an adage, a sacred value we pride ourselves on and indeed have executed expertly: “Quality over Quantity!” If we are to achieve Forward Presence and Power Projection, we must instead turn to the new values of “Quantity and Distribution.” We are accustomed to having the highest quality maritime assets on the seas. But in the current times, and for the foreseeable future, the US Navy cannot finance these types of assets in the quantity necessary to maintain a presence across the world’s oceans. Instead we need smaller and simpler vessels that are relatively inexpensive to produce and maintain. What they sacrifice in capability, such ships gain in speed and affordability—speed to respond quickly, affordability to be mass-distributed. Such a fleet would promote regional stability and establish a forward US Navy presence everywhere they are deployed. If a situation requires bigger guns, the Navy’s more capable (and accordingly more expensive) assets can be dispatched as backup. 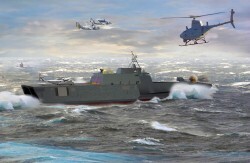 Smaller ships also offer the advantage of reducing vulnerability. Expensive gray-hulls are single high value targets compared to a dispersed group of low-cost vessels. What platform would fill this role exactly? 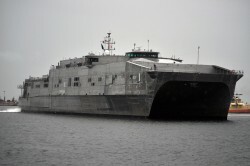 Perhaps a new program is needed, or perhaps an existing program can be adapted such as the Littoral Combat Ship (LCS) or the Joint High Speed Vessel (JHSV). One thing is for sure, it won’t be the DDG1000 or the Gerald R. Ford aircraft carrier. The Mobile Landing Platform (MLP) and its variant, the Afloat Forward Staging Base (AFSB), are promising programs. John Glenn, the second in this line produced by General Dynamics, was just floated in San Diego this past September. Essentially a modified oil tanker, these 840-foot vessels offer a plethora of storage space, a large open deck, and ballast tanks capable of flooding parts of the deck to take on hovercraft. MLPs may not be the quality of technological superiority that we are used to; but at a mere $500 million a copy, they bring capability for a price at which we can afford the quantity. As the US continues to shift from large-scale conventional wars to geographically diverse low-intensity conflicts, the Navy’s forces must be tailored with the current financial hardships in mind. With changing times come changing values, and it is finally time to shelf the demand for quality and instead favor quantity. Grant Greenwell and Chris Barber join us for the 7th edition of Sea Control. We careen around the road, covering with particular attention intelligence collection, the DDG-1000, and force planning for Amphibious Operations. Join us for Episode 7, the Defense Knitting Circle (Download). Sea Control comes out every Monday. Don’t forget to subscribe on Xbox Music or Itunes!